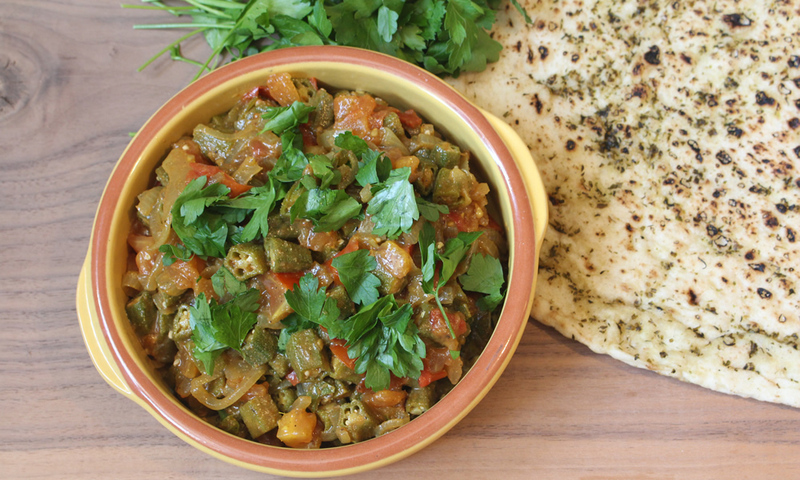 This recipe came about when I needed to use some Okra up before it went off so it started out being a bit of a ready steady cook moment using just what I had in the fridge and cupboards. Having done it a few times now and tweaking a little it’s still a very simple and tasty meal to make. Okra does have a little of a bad reputation not only is it sometimes called “lady fingers” but it also secretes a sticky goo when cooked which can put people off eating it. You will find that this will happen when cooking this recipe but stick with it and keep on cooking the okra through and this “goo” will disappear. As usual it’s best to prepare all the ingredients before you start. Cut the onion in half, finely slice and put in a bowl to one side, next top and tail the okra and cut into about 1 cm thick pieces and put in a separate bowl. Roughly chop the tomatoes and put in a 3rd bowl. In a frying pan on a medium heat add a glug of oil and when shimmering add the sliced onion and cook for 5 minutes until starting to brown. Add the okra and cook for a further 5 minutes. Add 2 tsp of garam masala, the 1 tsp garlic powder and chopped chilli and stir. Add a little water and scrape the bottom of the pan so the spices don’t stick to the bottom. Finely add the tomatoes and simmer for 15 minutes. Stir in the remaining teaspoon of garam masala and taste, season with salt and pepper. Sprinkle with the fresh coriander and serve on it’s own or with some rice and/or naan bread.